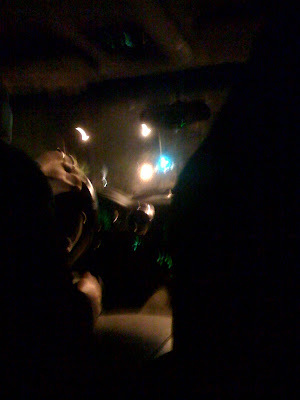 If it were hypothetically 2:30 a.m. and (hypothetically, of course) you were waiting for a cab when a big, black sedan pulled up & the driver flashed his cabbie credentials at you, would you get in? Hypothetically, aforementioned driver would tell you that he didn't have a cab sign (or whatever those deals on top of taxis are) because he works for a private limo service& is off-duty, & he doesn't have a meter but will charge you the normal price ($6 plus tip) that it takes you to get from Adam's Morgan to Cleveland Park. 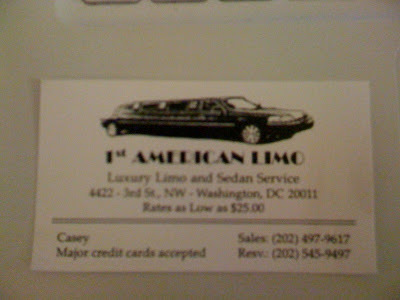 And to make you feel safe, he gives you his business card, which read "1st American Limo: Luxury Limo & Sedan Service," with his name (Casey) printed below, all in a fairly legitimate-looking business card situation. But then, you know, hypothetically, you might start to freak out when the realization sets in that you've just gotten into an unmarked black sedan, & you'd frantically text a friend with your location & all the information on the card while secretly hyperventilating at the thought of being abducted. To be fair, you tell yourself, a hypothetical, would-be abductor probably wouldn't provide you with his business card before absconding with you, but you never know, right? The whole way home, he chatters about cab drivers & how they screw you over on prices, how their cars are unclean, how much more reliable a luxury service is - issues that are probably of little concern to hypothetical abductors, though this isn't of particular reassurance to you. When he pulls up in front of your apartment, though, he realizes he doesn't have change for the $20 you provide him with for the $8 fare - & after a little bit of hemming & hawing, a quick apology for scaring you, & the obligatory plug for future Luxury Limo & Sedan Services, he hypothetically says "This one's on the house" & drops you off free of charge. This is all, of course, hypothetically speaking, & the stress of almost pulling a Natalee Holloway is probably enough to make you wish you'd just waited for some crummy, crusty yellow cab. But at the end of the night, you're home safe, & you made it there in a snazzy, leather-seated sedan - for free. So in that case, hypothetically.... score! I hopped in a gypsy cab once, behind Union Station. Should've known better when he insisted I sit in the front seat. I made him let me out when he mentioned he'd been busted for coke the previous week. I'd say, since he was a good guy about the fare, hang on to the business card and hire him again for a special evening out with friends or tell everyone you know about him so they'll use him! Get instant limos for different ocassions like private meetings, parties and for wedding ceremonies. I use a car service like that as often as possible and have for a long time so no that would not have sent my spidey senses a tingle.